Special primer for use on solid, porous substrates which absorb strongly or unevenly in order to level their absorbency. Particularly suitable for treating porous, absorbent substrates such as renders/plasters, unfired bricks, cellular concrete/AAC (autoclaved aerated concrete), natural stones and gypsum plasterboards (drywalls), concrete, lightweight concrete, cement-based Disbocret mortars and fillers/surfacers, cement floor and anhydrite screed. 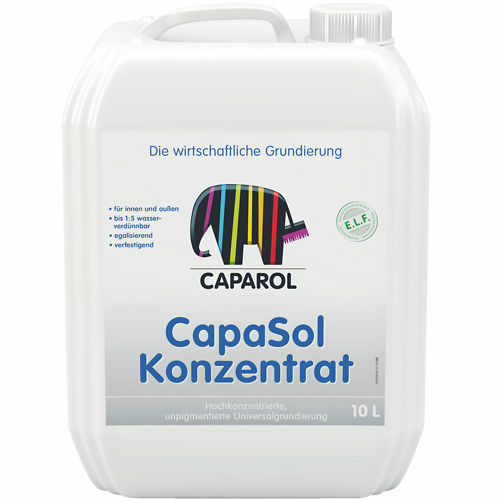 Do not use for compact, smooth/even surfaces like pure gypsum plaster (stucco) or wallboards, such surfaces are to be primed with Caparol-Tiefgrund TB or Caparol-Haftgrund. Water-thinnable (dilutable with tap/potable water).